Why waste your time and money with dealerships and workshops when you can get all your mechanical needs met in the comfort of your home or office? Mobile Automotive Solutions is the workshop that comes to you! Mobile Automotive Solutions is a licenced and registered mobile workshop. This means you can have peace of mind as services and repairs will maintain your new car warranty. All repairs are conducted according to model specifications and logbook requirements. This mobile workshop is backed by extensive experience in the industry across a range of car models. All work is carried out by a licenced technician, ensuring consistency, reliability and efficiency of service. 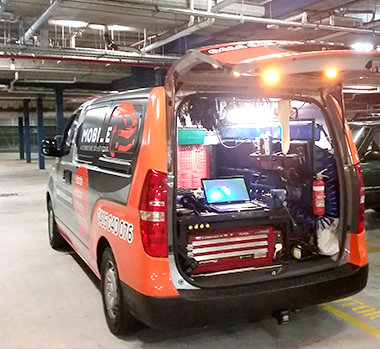 Our comprehensive mobile service covers all mechanical problems, including minor and major car service and engine problems on all private and commercial vehicles. At Mobile Automotive Solutions we are proud of our friendly and comprehensive service where the customer is informed every step of the way. At no point is any extra work performed without authorisation or approval. We are proud to offer a premium quality service at an affordable price. I badly needed work done on my Audi and Gab was happy to work around my hours. He came around to my house at 7pm and was wouldn't leave until the job had been professionally finished. (10pm!) He was professional and punctual and never tried to up sell anything (must be the only mech I've met that doesn't) Can't recommend Gab highly enough and will be getting all of my business in the future. Gab was relatively helpful but I had him look at a car before buying it but found his inspection was not thorough enough. I bought the car and then had to spend over $1000 on things that should have been picked up on including brakes and structural rust. It was such a relief to be able to call Gab this morning! He arrived in half the time he predicted (which wasn't long in the first place!) and my car was back on the road in perfect time for me to get to my important meeting. You can tell he is a professional, genuine guy, not the sort who tries to sell you unnecessary add-ons. He has a genuine passion for his work (just look at the workshop he has created in the back of his van!) and is willing to go out of his way to help. Thanks Gab! Very good service, much better than the workshop because you can always ask questions if you are not sure. Very professional. Recommended to someone who wants extra care for the car between major services. We just had the pleasure of having Gab. service both of our daughters cars at our home,and cannot speak too highly of his expertise and professionalism .This is really the only way we will service our own car when the time comes. True 5 star service a rarity in this day and age. All of the work done on my car has been through Gab at Mobile Auto and I've happily recommended him to friends and family as well. He's extremely professional and the quality of work just shows that he loves what he does. He is always honest in his work and doesn't talk you into getting unnecessary work done on your car which is rare to see! Definitely will not be changing mechanics in the foreseeable future! Gab was really professional and affordable. He arrived promptly and serviced my car fast. I had just bought the car so he let me know what condition it was in, what service it needed and what would need doing next service. He was honest and genuine and came straight to my door, so i didn't have to wait hours on my day off, stranded with no car. I will definitely be using him for my car servicing in the future! Thanks Gab! Excellent mechanic! I had taken my car to a few mechanics to fix it and they couldn't come up with an answer. He arrived on time, was great at explaining everything and was 100% honest. If your looking for a mechanic in the eastern or south eastern suburbs of Sydney, this guy is defiantly the one to go to! This guy has been my mechanic for the past 3 years, very reliable and a really fair guy, he is not the type to rip you off like other mechanics. His services are quick and he processes pink slips the next day. Why waste your time & money with dealerships and workshops when you can get all your mechanical needs met in the comfort of your home or office?